I walked 42890 steps on the trail today. I traveled about 17 miles today. Wild day of options and changes today. At the end of the day, I've wound up in Duluth for a zero day - never expected that one! We started at Mystery Mountain after a night of rain and hiked through cold, windy, rainy morning - not lots of fun but some wonderful views from hipoints over the continually more coloful sea of fall trees. The rain hounded us through the day as we covered miles and Bryan decided he'd cut his trek a day short. That meant we'd camp at Temperance River S.P. And he'd get a ride back up to Cascade River in the am. As we hiked on, I contemplated our options. As long as he's done, he could get a ride this evening and skip a forecast wet cold (28 degree) night in the tent. When we reached the S.P., there was only 1 campspot left and a line of 3 people behind us. So, we took the site, went outside and discussed things. We'd need to arrange a ride in order for Bryan to get his car. As we were talking, Andrew who works at th park walked by. I said HI and we chatted a bit and let him know we were figuring out how to get upshore a ways. He was heading that way at 7pm and offered a ride! Now Bryan was set with a free ride and I had a site to myself. Not looking forward to another wet night, with a forecast of snow on Saturday, we decided to give up the campsite and both head to Duluth. I would figure out a ride back to Temperance on Sunday after the cold and wet blew through. So, a long day of hiking topped off with a drive to town has me relaxing for a day. I've been told taking a day off each week is a good idea anyway. What I learned from the day is to gather all your options, make a decision, but continue to look for improvements and further options. Otherwise, you may make a quick choice and miss out on a better solution that just took a bit more thinking. 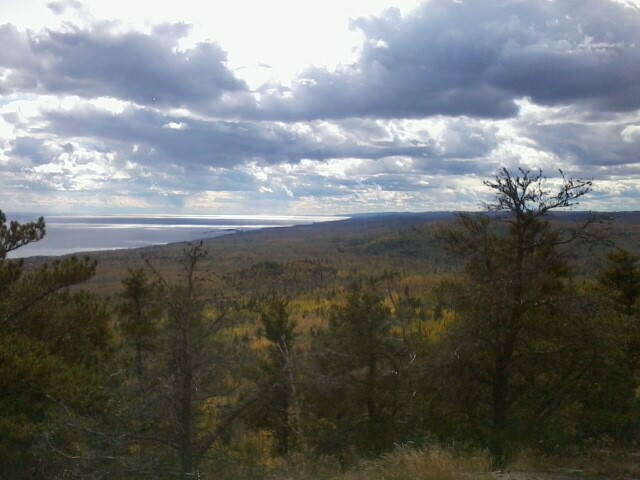 This pic is fromthe tiptop of Carlton Peak just north of Temperance River on the SHT. It is the highest spot around and you can see at least 20 miles.